Bo’ness tenants were treated to a real festive cracker this year as they celebrated at their annual Christmas party. 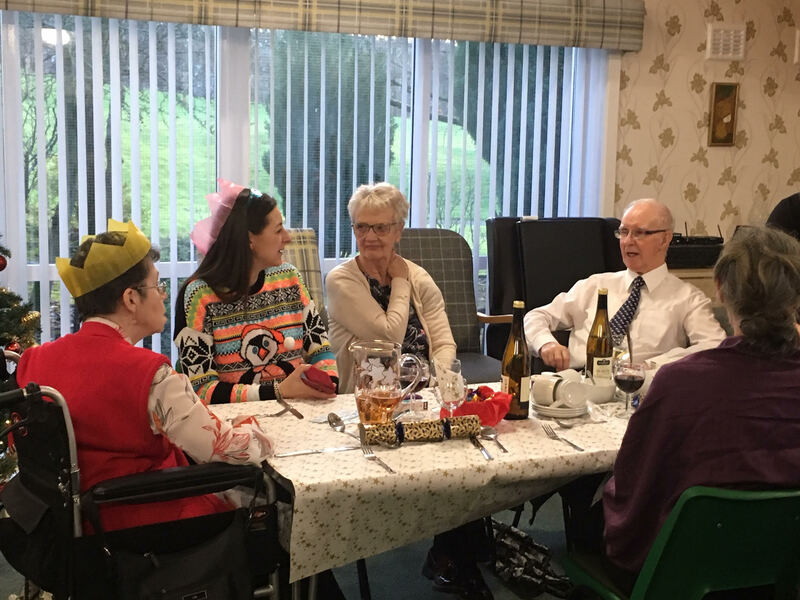 Tenants at Bield’s Dean Court Retirement Housing development took part in a day of festivities, donning party hats and indulging in a lavish three-course meal. Served by staff and family members, the 20 tenants and five family members and friends had the option of winter vegetable soup or a melon cocktail for starters. For the main, tenants chose between roast turkey served with all the trimmings and braising steak with seasonal vegetables. Finishing the feast in style, those with a sweet tooth chose from gateaux and cream or trifle, while cheese and biscuits were on the menu for those preferring a savoury option. The party continued with a raffle, featuring prizes such as toiletries, chocolates, wine, knitted dolls and a biscuit hamper. Raising a grand total of £79, the sum will be put towards the maintenance of the development’s fish tank. To finish the night off, musical guest Davie Glen performed a series of songs from many genres including Scottish, country and western music. The singer also sang hits from the 50s and 60s, as well as a Christmas song or two to get tenants in the festive mood. Alison Lowe, retirement housing manager at Dean Court, said: “Tenants seemed to have a lot of fun at the party. It was superb to see them all gather round and enjoy a wonderful dinner together. “Some of the staff’s family members and relatives of the tenants also came along to lend a hand and help with the meal in the afternoon. We could not have done it without their efforts.